The modern office doesn’t always look like, well, an office. Instead of having your team work around a strict schedule, get a schedule that works around your team. Hit your coverage goals without boxing people into pre-defined work shifts using a clean UI that makes fine-tuning easy. Real life happens. Keep it all balanced with a system that accounts for last minute changes and scheduling irregularities. When your office is “everywhere”, you need a built-in calendar that covers the work day for your distributed team, no matter when that day starts. We built Happy Schedule for ourselves first, and you could say we were happy with the result. Happy Tools starts with a 30-day free trial, no credit card required. After that, monthly pricing starts at $60, which includes your first 12 members. Then it’s just $5 a user after that. Pricing so simple we don't need a chart. From our office to yours. We know Happy Schedule is a good tool because we use it every day. 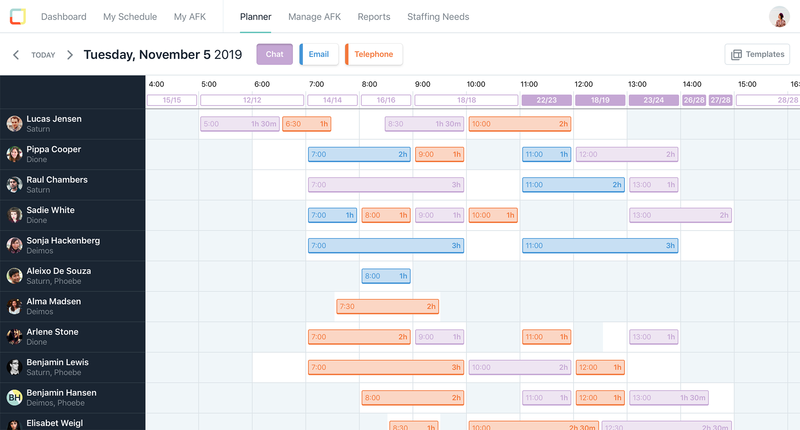 We built it for ourselves here at Automattic, to help us tackle a problem that plagues companies like ours—scheduling in a modern, distributed work environment. Trust us, this thing is a game changer. And it’s only the beginning. We’ve got more tools in the works. Try out this one while we refine the others, you’ll be happy you did.